Sterilize one half-pint mason jar, a new lid, and a canning ring. In a non-reactive pan bring vinegar, sugar, and water to a boil. Once the liquid has started to boil place the peppers in the brine and continue to simmer over medium heat string occasionally. Simmer for about three minutes then remove from heat. Carefully remove the sterilized jars from the hot water. 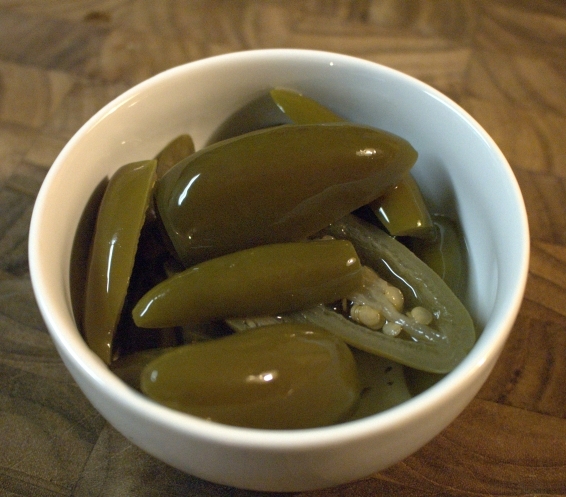 Pack the sterilized peppers into the jars and fill with brining liquid. Wipe the rims of the jars, affix the lid, and screw the canning ring in place. Submerge the jar in a hot water bath and process for 10 minutes under boiling water. Carefully remove from the hot water bath and allow to cool before storing in a cupboard. Store for at least 2 weeks. Refrigerate after opening.